Slightly more modern in style, the 2012 La Clape Grand Vin is sensational blend of 55% Mourvedre, 25% Syrah, 15% Grenache and 5% Carignan. Completely destemmed, it saw a whopping 50 day maceration before having the Syrah and Mourvedre moved to 225-Liter barrels (33% new) and the Grenache to vat, where it stayed for a year. At that point, it was all blended together, and moved to vat for another 12 months before being bottled with no fining or filtration. It exhibits lots of creme de cassis and black raspberry fruit to go with subtle oak (which fades with time in the glass), melted licorice and graphite. This gives way to a medium-bodied, pure, elegant red that has gorgeous purity of fruit, a great mid-palate and fine tannin that emerges on the finish. This is high quality juice that can be enjoyed now, or cellared for 4-5 years, possibly longer. Deep red color with hints of black. 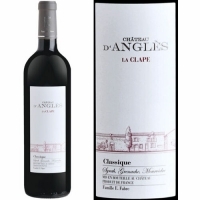 Complex bouquet with a blend of ripe red and black fruits, spices, licorice and tobacco flavors hilghlighted by the typical minty touch of La Clape. Full-bodied and elegant mouth structured by dense and remarkably silky tannins. Great lengh endowed with a nice freshness.